As soon as this month, the city of Columbus will breach the Fifth Avenue dam, opening up a beautiful new corridor through Harrison West. Through the northern half of our neighborhood, though, this monumental, long-in-coming change to our river will be hidden behind a wall of honeysuckle and other invasive species. What to do? We’ve got an idea! The river sparkles when viewed from Harrison Park—a sight that was invisible just two years ago. We opened up the view from Side by Side Park just last month. 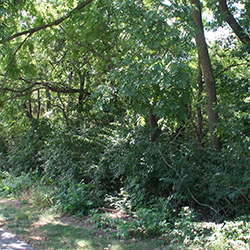 Now, the Harrison West Society Parks and Green Space Committee will continue its push to clear the honeysuckle from the east bank of the Olentangy River in our neighborhood. You can help. The committee, in partnership with the Columbus Volunteer Challenge, the city of Columbus Recreation and Parks Department, Hands On Central Ohio, the United Way, FLOW, and Battelle, will be hosting a volunteer opportunity that will dramatically change the view of the river along the Olentangy Recreation Trail. On Saturday, August 25, 2012 from 8 until 11 a.m., volunteers will work to remove invasive honeysuckle from the riverbank between West 3rd and West 5th Avenues. Please plan to help us out for the entire three-hour work period and then join us for a hot dog lunch between 11 a.m. and noon. As part of the Columbus Volunteer Challenge, we are looking for as many as 200 volunteers to haul cut brush up the riverbank and stack it for chipping and disposal. You’ll get a great workout, do some good for the environment, and be one of the 20,000 Columbus residents who are celebrating the city’s 200th birthday by chipping in to make it an even better place to live. To be a part of this fantastic project that will open up stunning views of the Olentangy along the Olentangy Recreation Trail, visit www.handsoncentralohio.org. Want to help but aren’t sure you’re up to hauling brush? No problem. We need volunteers who can help check volunteers in and serve lunch. Visit www.handsoncentralohio.org to register, and tell them you want to volunteer for light duty. If you want additional information, contact the Harrison West Society Parks and Green Space Committee. Hands Needed! Last Bank Heist of the Season!